Requires 100 QSO's on VHF band. Of the 100 contacts with different stations at least 70 must be Australian. If the applicant movers to a new location and it exceeds a distance of 240km direct from the old location then a new application will be necessary for the new location. 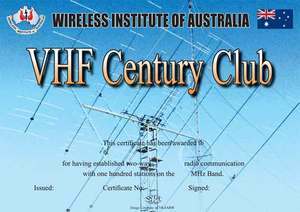 • Requires 100 QSO's on VHF band defined as all bands 50MHz and and above. • Of the 100 contacts with different stations at least 70 must be Australian. • If the applicant moves to a new location and it exceeds a distance of 240km direct from the old location then a new application will be necessary for the new location. • Contacts must be made on or after the 1st June 1948. 1. All applications must be made using the online award system. The Awards Committee can provide support to migrate from existing Excel forms. 3. Contacts for the awards must all be made from within the boundaries of a single DXCC entity. 4. All QSO’s must have been made since 01 June 1948. [this award only]. 5. Applicants are required to prove confirmation for all QSO's claimed. Paper, eQSL and Logbook of the World (LOTW) are our current acceptable confirmation standards. a. DXCC entity numbers must be verified by yourself before award submission using the "Verify DXCC" function. b. LOTW confirmations must be verified by yourself before award submission using the "Verify LOTW" function. c. eQSL confirmations must be verified by yourself before award submission using the "Verify eQSL" function. Only confirmations from "Authenticity Guaranteed" members of eQSL will be accepted. d. Physical QSL Cards must be verified by two licensed amateurs using the "Verify Paper QSL" function. If requested by the WIA, the QSL cards must be forwarded to the Awards Committee for checking. Do not send QSL cards with application. 6. Do not send QSL cards with application. However, all QSL’s must be in possession of the applicant and may be requested at anytime. a. must be made from and to, land-based, or permanently moored vessels [proof required], using direct terrestrial propagation via the same mode and band without assistance of the internet or anyone for each claimed contact. b. QSO’s made on ‘nets’ are acceptable as long as the basic QSO information [callsign & signal report] is exchanged and confirmed unassisted. c. Contacts made via any other terrestrial means are also acceptable, such as cross-band, via a repeater or any other means that is deemed to be acceptable by the Awards Committee. 8. Prearranged contacts [skeds] or via ‘nets’ are acceptable as long as the other criteria are met. 10. All information supplied in an application for an award must be accurate and truthful. 11. The information listed on application must accurately match the information on the QSL cards. 14. Contacts must be entered on the form as instructed on each award application. 16. QSO’s may be made using multiple callsigns providing each call used was issued to the applicant at the time of the claimed QSO(s) and all contacts were made from the same DXCC entity. Scanned copy of multiple licenses may be requested to prove the license(s) was/were issued to you at the time of the claimed QSO(s). 17. All QSO’s claimed must be on bands/sub-bands/modes/power-levels permitted by the licensing authority for that class of license at the time of the contact. 18. All individual contacts must have been made using the same mode & band in both directions. 19. Awards are available in the following modes: OPEN, CW, PHONE and DIGITAL. c. PHONE: SSB, ISB, DSB, AM, FM, NBFM, PM and other forms of voice transmission/reception. d. DIGITAL: RTTY [FSK/AFSK], PSK, AMTOR, PACTOR, OLIVIA, CLOVER, JTnn, SSTV*, HELL, and all other forms of digital transmission/reception. * Note: although SSTV mode can be either analog or digital, all versions are considered to be in the Digital category. If in doubt, contact Awards Manager for a ruling. 21. Club and Society Stations may also apply for awards. Certificates will be awarded to the Club. An officer of the club or society must sign the application, indicating their position. 22. QRP endorsement is available for all awards. QSL cards must clearly indicate that the applicant’s power was 5-watts or less output. Description of QRP transmitter and method used to measure output power must be provided. 23. If one or more QSL is requested as part of the processing procedure, they may be posted by airmail (with return postage or 1 IRC and return envelope) or scanned and emailed as attachments in “.JPG” format and of a high enough DPI to be clearly viewed. 24. Applications that are considered unacceptable by the Awards Committee will be rejected and the applicant notified of the reason for rejection. The rejected application can be resubmitted once the reasons for rejection have been corrected. An application rejected three (3) times will not be further considered. 25. The award .xls file is a dynamic master file that is used for processing, updated and returned to the applicant for use for the next update. This master file is also transferred into our award master database. 26. If callsign of applicant has changed, they may apply to have the change shown on the standings instead of the old callsign, as long as it relates to the same country as the original application. 27. Signatures of witnesses are not required on electronic applications, but, each witness must understand that they may be contacted to verify that they have witnessed the application as being accurate and truthful. 28. Decisions of the Awards Committee are final and not subject to dispute.